CORMETECH manufactures catalysts that are installed on natural gas, refinery gas, syngas, diesel oil, crude oil, heavy fuel oil (HFO), vacuum residual oil (VRO), asphalt, and Orimulsion applications. We bring strong experience on these fuels with over 1,000 installations worldwide. Our catalysts achieve greater than 95% NOx removal at less than 2 ppm NH3 slip with the ability to achieve Zero-Slip™. CORMETECH can tailor performance guarantees to meet individual customer needs. 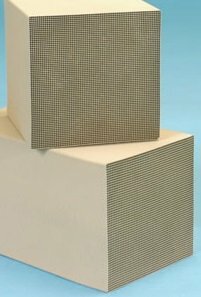 CORMETECH catalysts are ideal for a variety of flue gas particulate properties. For example, gas turbine applications are typically designed around smaller pitch catalyst. However, we also offer larger cell pitch selections for applications for high particulate gas streams, such as for gas boilers or oil-fired units. CORMETECH offers customized catalyst compositions to fine-tune catalyst properties for optimal performance at a range of operating temperatures (typically 480oF – 1100oF). Our catalyst modules are designed for horizontal and vertical flow orientation. The integrated design of our SCR catalyst and its modular frame maximizes NOx reduction and reduces plant auxiliary power use. CORMETECH METEOR™ catalyst, provides multi-pollutant emissions control for combustion turbines and internal combustion engines. METEOR is an all-in-one catalyst that controls NOx, CO, VOC and NH3 emissions across a wide temperature range. Key additional benefits include smaller footprint space within the duct, enhanced efficiency through reduced pressure loss, broader load flexibility, reduced sensitivity to catalyst fouling agents, and lower maintenance costs. CORMETECH offers a range of catalyst management services to successfully operate an SCR system. CORMETECH is able to monitor your SCR system, perform routine inspections, and periodically evaluate catalyst performance, which is key to maximizing catalyst life and maintaining optimal performance. For more information on our services click here.